Harbor Island is a 1,700 acre private gated community located on a barrier Island with over 2 miles of white sand beach bordered by Harbor River, St. Helena Sound, The Atlantic Ocean and Johnson Creek. Along with its' sister Islands, Hunting and Fripp, it offers protection to the delicate marshland to the west that supports one of the richest eco-systems in the world... a microcosm of plant and animal life that thrives amongst the waves of Spartina Grass, which in turn nourishes shrimp and snails, oysters, fish, porpoises and other animals and marsh birds up the food chain. 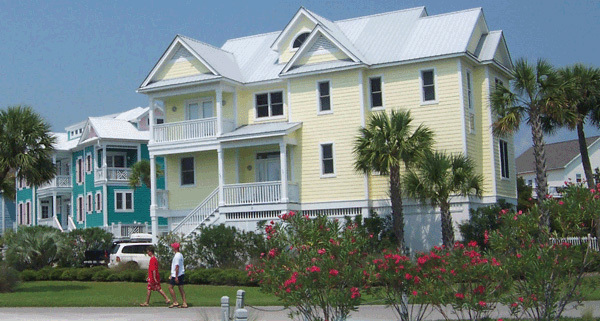 What distinguishes Harbor Island from other seaside communities is its uniquely tranquil Lowcountry beach lifestyle. Here fishing, crabbing, kayaking, beach-combing and reading while swaying in the breeze in a hammock are relaxing recreational mainstays. For more active individuals the Island's social hub is the recently renovated Beach and Racquet Club located mid-island. It offers four Har-tru tennis courts, a large community pool, separate kiddie's pool, volleyball court, children's playground and a fitness center. are to be found below!